Learn to accessorize, oilers! :) My most favorite part of this job is empowering people on their mission to grow stronger and healthier, body, mind and spirit. Have fun with oils. Let your personality and unique interests come through in your sharing. The best way to do that is to be stocked with supplies like droppers, sprays, rollers, carrier oils, and labels. Having these items on-hand will make oiling easier to incorporate into your everyday life. And if you have family--especially spouses--who aren't yet "sold" on oils or your business, set up an oil station, categorize your EO's by use or color, and have supplies queued up in a drawer nearby, so anyone can take advantage. And for those of you who are doing "the business" side of Young Living, having your supplies in order, makes handing out samples, giveaways, and holding classes and video demos simpler. Below are just a few of our favorite glassware supplies and labels. To view the complete list of accessories (most Amazon Prime-linked), visit our Supplies Page. Use them to make oiling easy with pre-diluted oils or unique blends for any occasion. Rollers make great gifts and giveaways or samples for friends, and no, if it's a sample, you don't need to fill it to the top. The best come with metal roller balls on top. Others are plastic or glass roller balls. It's up to you, but the metal ones last longer and the oils won't break those down. 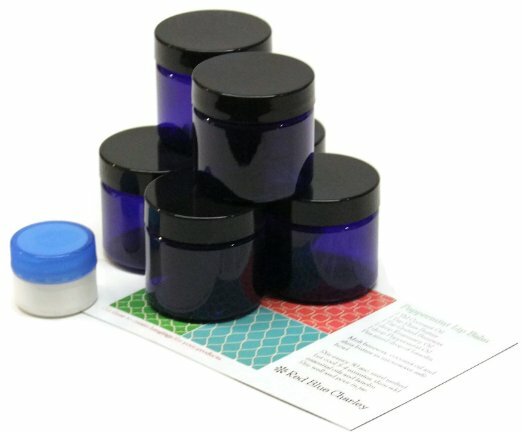 You can also get a set of YL's Aroma Glide fitments (rollerballs) to pop on top of your used EO bottles (they fit both 5ml and 15ml YL bottles) on the company's accessories page. Rollers come in various colors, just be sure they are dark or opaque glass to protect the integrity of the oils. See below for the complete gallery of blue and brown apothecary rollers. All images are linked to Amazon Prime pages for easy ordering! How do I love thee? Let me count the ways. Droppers are great for storing carrier oils as you'll find using a large squeeze bottle is not only messy, but wasteful of precious carrier oil when it pours out all of your counter, clothes and drips through your palm. Make your life easier, oilers! Take some glass droppers, and add carrier from the large bottles into the little droppers, then label, now you can actually and safely and cleanly add the correct number of carrier drops for your desired dilution rate! Now, for sprays. Glass sprays are great for making custom blends and diluting with water to spritz around a room or bathroom in lieu of a diffuser. They are also great to keep in your purse or have on your kitchen. You can also dilute oils in a spray with carrier oil rather than water. Sprays can cover larger areas than a roller can. For example, spray carrier oil-diluted blends on your feet or hubby's back. You gotta have them on-hand. Whether they're small for cosmetic use or carrying in your bag or you're making gifts and going for mason jars, set yourself up for success in your oiling and be sure to stock up to make oiling (and life, in general!) easier. Small jars are great for creams (think fluffy whipped shea butter with your favorite carrier oil for skin combined with Frankincense or Sandalwood essential oil) and gels (such as aloe mixed with Lavender and less Peppermint). Mason jars, on the other hand, are useful for salts and sugar scrubs (dry or diluted with carrier, up to you). I love jars for gift-giving too. Just label it, including ingredients to be sure the user is aware and able to use the ingredients with which the item was made. If a gift, tie a ribbon around it or pop them in a cellophane bag for an added touch of creativity!